Unless otherwise specified elsewhere, basic colours for the identification of electrical conduits and trunkings and their coverings from other pipelines or services shall be orange for electrical services in compliance with BS 1710. 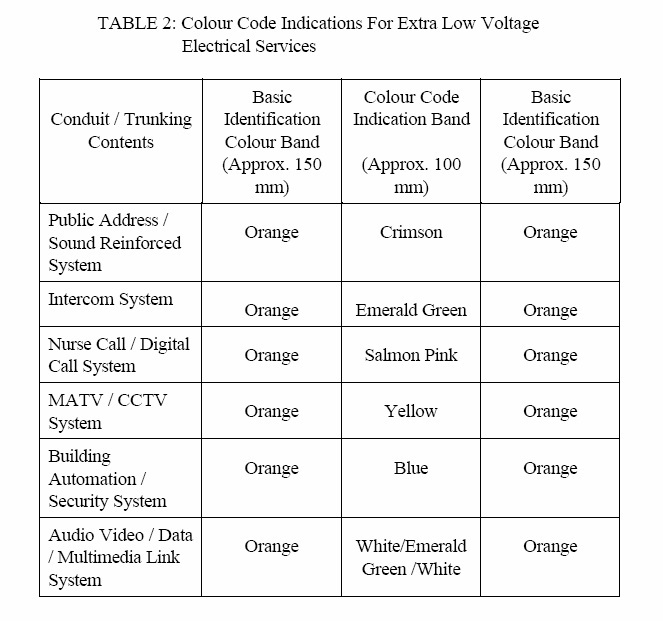 For extra low voltage electrical services, colour code indication band shall beprovided. The basic identification colour shall be applied by painting over the whole length of the conduits and trunkings and their coverings. However, if decorative colour white or other decorative colour is used for exposed electrical conduits and trunkings and their coverings as specified and/or as directed by S.O.’s Representative, then orange colour identification band shall be provided. In addition, for all extra low voltage electrical services, colour code indication bands shall be provided as in the Table 2 below. Colour identification bands shall be provided on the conduits and trunkings and their coverings as a band over a length of approximately 150 mm. Three colour bands shall be used to identify various extra low voltage electrical services. The outside colour bands shall be the basic identification colour and the centre band shall be the colour code indication band. The centre band may be of one colour or a combination of colours within the width of approximately 100 mm. The colour identification bands and colour code indication bands shall be applied by painting or adhesive colour bands at intervals not more than 1000 mm along the conduits and trunkings and their coverings. They shall be provided at junctions, both sides of service appliance, wall/floor penetration and any other place where identification is required and necessary. 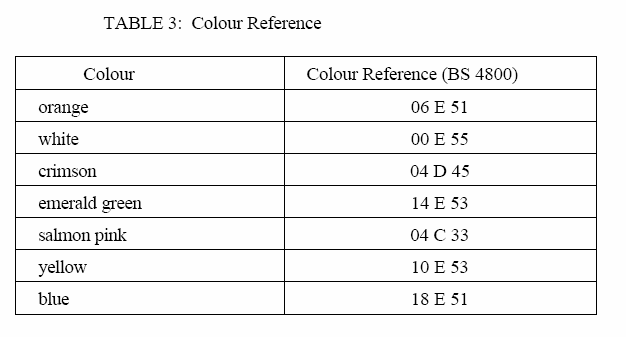 The colour reference to BS 4800 shall be as in Table 3 below. IqL4yn Thankyou for all your efforts that you have put in this. very interesting information.